Google knows who I want to email before I email them. It knows what I want to type before I type it. It even knows where I want to drive to before I drive. So it was only a matter of time before Google figured out what I wanted to write with my pen before I finished my pen stroke. And now Google’s showing off this newest feat of machine learning in Samsung’s next major Chrome OS laptops: the Chromebook Plus and Chromebook Pro. Samsung’s newest Chromebooks were designed in tandem with Google so they’re not like Chromebooks you’ve seen before. They look a little stubby next to something like Samsung’s updated Notebook 9. That’s due to the display. Instead of a traditional widescreen display like those found in nearly every other notebook on the market, the Chromebook Plus and Pro have iPad-like 3:2 2400 x 1600 displays. That make them significantly more square. And the decision to go with a stubbier 3:2 display ratio is directly tied to the sweet predictive writing Google’s including in the newest version of Chrome OS. It’s also why Samsung’s new Chromebooks also have 360-degree hinges, a Samsung Note-like stylus built in, and ship with Android’s Play Store. Samsung and Google want you to use this device as a tablet as often as you use it as a laptop. But the new Samsung Chromebooks won’t be the best bet for artists or other professionals yet. The stylus they ship with is the tiny kind meant for quick notes rather than intensive image creation and editing. 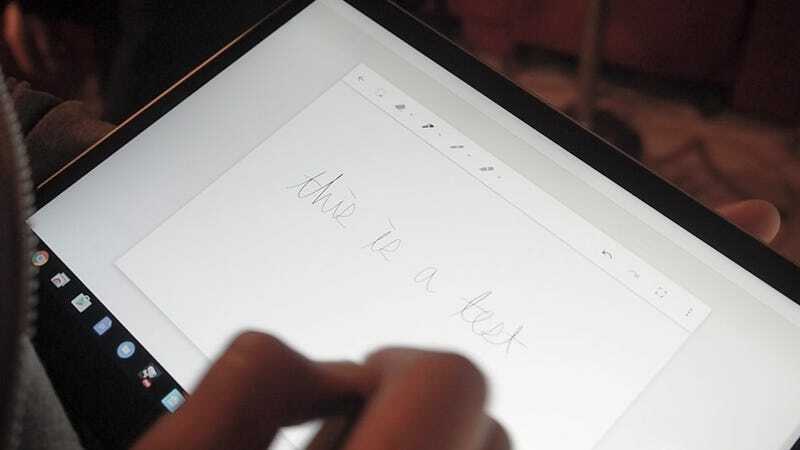 And the other features tied into Chrome OS’s new ability to recognize pen input, like the ability to turn scribbles into text and automatically tighten up hastily drawn shapes into perfect circles and squares, are already found in iOS and Windows. So what really sets the Chromebook Plus and Pro apart from competition is the price. The Plus, with an ARM processor, 4GB of RAM, and 32GB hard drive, starts at just $450 when it ships in February. The Pro, with an Intel Skylake coreM processor, 4GB of RAM and 32GB hard drive, will likely cost more, and won’t ship until later this spring.